Wellington’s Hailey MacDonald will be representing Canada at the Miss Teen Petite Beauty International Pageant in the Dominican Republic in April. That’s the exciting conclusion after 11 days MacDonald spent in Toronto last month at the Miss Canada Global Pageant, her first beauty pageant. MacDonald recalled that she liked one of the pageant’s photos on Facebook over a year ago and with the permission of her parents, Lisa and Rick, she applied to participate. She conducted phone and paper-based interviews about her likes and dislikes, her feelings about Canada, true beauty, and role models. She was accepted to attend. Not long after her arrival and days of training on hair, make-up, confidence, and walking in four-inch heels — another new experience — she was able to room with three older girls from across Canada. They formed a bond over long days touring Toronto landmarks and sharing experiences. Through her sponsorship raising efforts before the Miss Canada Globe Pageant, MacDonald was fast-tracked to the final eight competitors for Miss Teen Canada Petite competition. In Toronto, MacDonald took part in a talent competition and she felt she impressed the judges with her dramatic reading of Maya Angelou’s poem “Phenomenal Women” by memory. Lisa noted that one of the older competitors also read that poem, but used cue cards. Hailey also did interviews about the Royal Lepage Shelter Foundation, her chosen platform organization, that supports women and children escaping violence. Prior to the pageant, she actually made a viral video about the foundation that earned 1,500 votes on social media. That placed her in the top three. In addition to striving to do her best in those competitions, MacDonald also learned that a beauty contestant must always be cognizant of her actions. Over the course of a pageant experience, each contestant is being watched and they can lose points for their appearance and for their interactions with staff, past queens, and the public. “The judges followed you, but you didn’t know they were judges. They sat near us. When I went on stage, I saw a couple of them. It was sneaky,” she said. Lisa added conduct was a major portion of the competition as the company wanted to know how its representatives might act while touring internationally. Ultimately, MacDonald passed the scrutiny and was named Miss Teen Globe 3rd Princess. Initially, placing fourth, she didn’t know that she’d be able to travel but pageant officials made an offer the next day. “It’s a pretty good feeling,” she said. Leading up to the pageant in the Dominican Republic, MacDonald has new responsibilities after being crowned Miss Teen Southern Ontario Globe 2018. She will have to make three charitable appearances a month and maintain her grades. Last weekend, she appeared at the Picton Fair baby show. 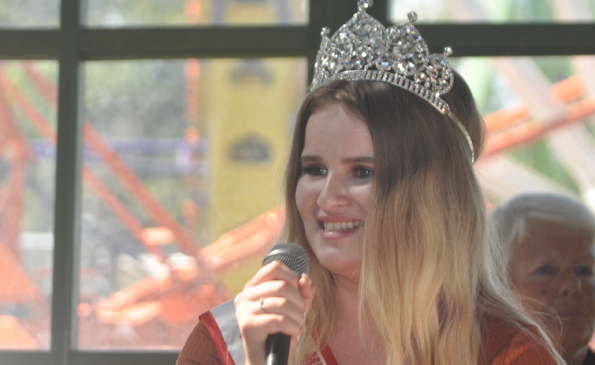 Lisa said initially she was leery about the pageant, having heard about scams related to modelling, but said it turned out to be great for her daughter. Both mother and daughter said they’d recommend the experience to others.